According to the Duvergerian theories, in the long run, only viable parties are expected to stand for elections. Non-viable parties should join a pre-electoral coalition with another party or withdraw from competition entirely. Why then do non-viable political parties throughout the world systematically continue presenting candidates? This book responds to this evident but unanswered question to create a general theory about deviations from the Duvergerian equilibrium. The author argues that, far from being just a random or irrational decision, the choice of political parties to present candidates when they do not expect to achieve representation can be explained by the overlap of electoral arenas, that generate opportunities for viable parties to present candidates where they are non-viable. In sum, political parties will take advantage of their viability in an arena to present candidacies in other arenas where they do not have chances to become viable. 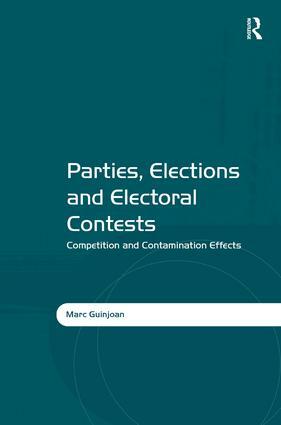 The building of this new theory on electoral contamination allows the construction of a new and more encompassing conceptual framework through which to make sense of what, until now, has been understood as disparate phenomena and contributes to a better understanding of political parties’ strategic behaviour. Marc Guinjoan is doctor in Political Sciences at the Universitat Pompeu Fabra. His research interests are focused on electoral systems and party strategies. He is also interested in political behaviour, as well as in decentralisation processes and in nationalism. He has published articles in international journals as Social Sciences Quarterly, Nations and Nationalism or Regional and Federal Studies, as well as some book chapters and journal articles in reviews in Catalan and Spanish, including a recent book on Catalan politics. He is currently researcher for the Making Electoral Democracy Work project.